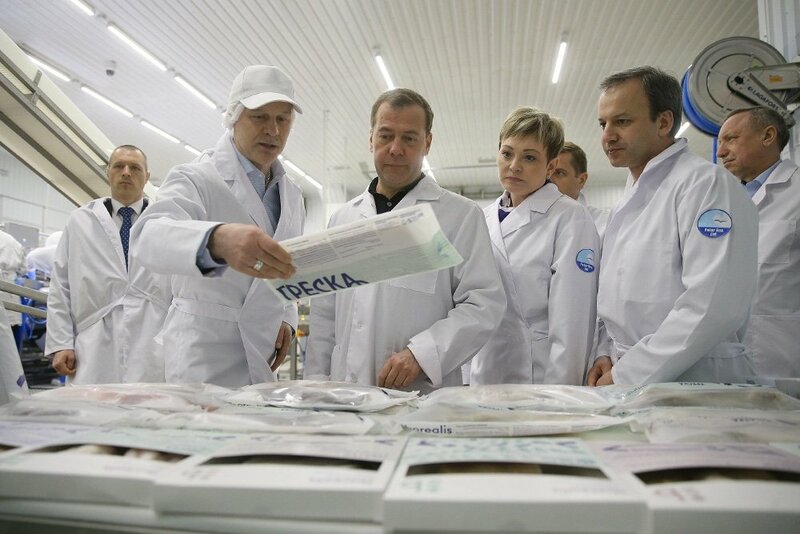 Prime Minister Dmitry Medvedev held a meeting on the development of the fish processing industry in Murmanks. He remembered how he came to the region in 2008, and when he went to one of the stores, he did not find any domestic fish products on the shelves. The experts think that soon there will be more innovative fish-processing plants in Russia like this in Murmansk. The plant is settled down on the area of 55 thousand square meters. It has already reached the designed capacity, and created more than 100 jobs. The distinctive feature of the pant is the unique superchilling technology developed by Skaginn3X (member of Knarr Maritime). Thanks to this innovative technology the set temperature is maintained over the all further cycles: production, logistics and trade. "In ten years the situation has changed, but, of course, certain problems in the industry remain, and, consequently, they are both on the shelves and on the tables of consumers," said Head of the Government. In general, the fishery complex is growing. Last year, the catch of Russian fishermen reached almost five million tons. Both in the country and abroad there is a demand for products, and export is also growing. Russia can expect more if it solves a number of problems. "According to our estimates, the lost profit for the Russian budget is about 30-40 billion roubles per year," said Ilya Shestakov, Deputy Minister of agriculture, Head of Rosrybolovstvo. By the results of 2017, the volume of exports amounted to 2.1 million tons (+ 12 percent in comparison with 2016). But due to the prevalence in the structure of the supply of products with relatively low added value, the cost of such exports is low - about 2 thousand dollars per ton. The breakthrough in the situation should be the introduction of new fishing vessels and processing enterprises under the investment quota mechanism. In the first stage of application acceptance in 2018, more than 50 projects for the construction of new fishing vessels and onshore fish processing plants were selected or admitted to a competitive procedure. The total volume of declared investments for these projects amounted to more than 130 billion roubles. Head Rosrybolovstva drew attention that it is important to strictly comply with the timing and quality of construction, and asked the heads of the coastal regions to assist these projects. "By 2025, we expect a significant change in the existing raw materials model," said Shestakov. By this year, for pollock and herring, the share of products with high added value should be at least 50 percent, according to Atlantic cod and haddock, the proportion of fillets and minced meat should reach 80-90 percent from the current 40-50. Dmitry Medvedev called the idea of investment quotas in the fishing industry absolutely correct and stated his intentions to expand it. "It is planned to conduct an application campaign to distribute quotas for the crab catch, we expect that, thanks to this, we will also have more crab vessels," he said. Now a corresponding Cabinet resolution is being prepared. And on March 1, a campaign began for investors ready to put money in the construction of small vessels in the Far East and the North. But the problem of obsolescence of a small fishing fleet is typical for the southern Russian seas, where, the head of Rosrybolovstva underlined, in places it is necessary to talk about its re-creation. The need for such vessels can be up to 100 units. "The program for updating this fleet will amount to about 500-600 million roubles a year," Ilya Shestakov said in a joint statement with the Ministry of Industry and Trade. "Since the currently available measures, in particular interest rate subsidies, are clearly insufficient, it is important to develop a new mechanism: for example, provision of compensation and capital expenditure for the construction of such vessels. "